Monday I had every intention of writing about my canning experiences over the past weekend. I put up 10 jars of salsa; oven-dried 2 dozen tomatoes for future use; made two large jars of pickles; and found time to infuse a quart of light olive oil with basil for a winter's fill of fragrant basil oil and pesto possibilities. There are tomatoes yet to be canned; I purchased a case, 25 pounds worth, from Giordanno's in the Italian Market on Saturday. As Liz has been saying for the past 4 days, we have "Too Many Tomatoes", the title of one of her mother's cookbooks from the 1970's. For a gal who can't abide a raw tomato, I sure do like to cook with 'em! Canning is kind of a lost or completely unknown culinary art for most people. I discovered how easy and fun it is about 8 years ago. While I've not put up jars every summer since, I try to make the effort to can some tomatoes each year. Mostly I tend to oven-dry cherry and small plum tomatoes so that I have some essence of the summer to carry me through the dreary tomato winter season. Even if there isn't the time, energy or inclination to put up salsa or tomatoes in their juices, at the very least I'll make a big batch of basil oil. From this I get a two for one - the oil is infused with the heady scent of basil and the "basil sludge" that I strain off gets frozen and used as a pesto base or as a quick flavor booster in pasta sauces and other pan sauces throughout the winter. Freezing small batches of the basil puree in ice-cube trays keeps them ready for several months. I also like to freeze the chartreuse green oil in small batches, keeping it free from spoiling and growing mold. There's nothing worse than finding that you have Fuzzy Wuzzy the Moldy Bear sleeping in your jar of precious green oil. Anyway, I wanted to share this cooked salsa recipe. It's a variation of the Ball Canning Recipe for Traditional Salsa. I've added peppers, onions and cumin to the mix; it's just not a garden salsa without these flavor boosters. If putting up jars of salsa is too scary for you - just make a batch and refrigerate it for up to 2 weeks. The salsa is so good, fresca or cooked, that it won't last long. However, if you want to impress your friends and have handy holiday gifts, can a double batch. You won't regret it. Buy the freshest and best tomatoes you can find. They are in peak season now, and you can get them inexpensively at Sue's Produce on 18th & Sansom, at any farmer's market, or of course at the Reading Terminal or Italian Markets. As I wrote yesterday, YES YOU CAN, Can! Purchase pint or half-pint jars with bands and lids. Wash canning jars, lids & bands in hot soapy water. Dry bands & set aside. Place cleaned jars & lids (but not the screw bands) into a large stockpot of water. Bring to a simmer – 180º and maintain at 180º. Wash and prep all the vegetables. Combine all vegetable ingredients in a large sauce pot. Bring mixture to a boil. Reduce heat and simmer for 15 minutes. 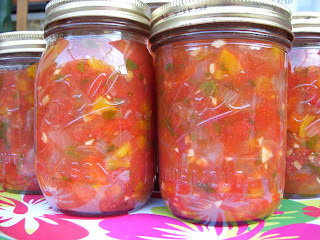 Carefully remove 1 jar at a time and ladle hot salsa in to hot jars, leaving ¼-inch headspace. Process the filled jars for 15 minutes back in the water-bath stock pot.